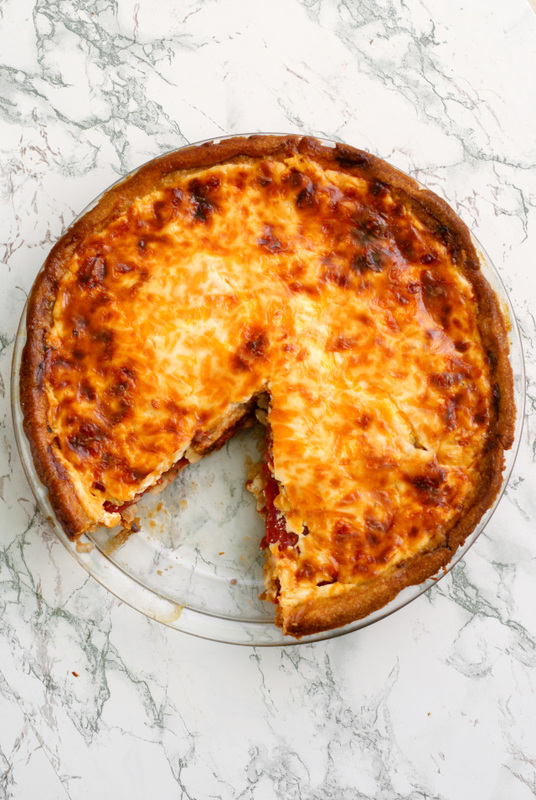 A Tomato Pie is a savory pie filled to the brim with gorgeous tomatoes, fresh herbs, tangy greek yogurt, and lots of sharp cheese. A few years back, my step-mom gave me this recipe for tomato pie. I don't remember the circumstances that led up to her giving me the recipe, but it has sat in my file folder where I store my magazine clippings and printed recipes for quite some time. Up until now, I hadn't gotten around to making it. Not sure why. I'm actually kicking myself for not making it sooner because it was good. My mother recently paid a visit to my grandparents in Delaware and a short time after she came home, my grandfather sent a big ol' box of Jersey tomatoes to share with me and my sisters. Lucky us! When I got my tomatoes, this is the first recipe that popped into my mind. I dug in my files until I found it and I just happened to have everything on hand to make it. I'm guessing you might be wondering what is in a tomato pie. Everyone I told about it just looked at me with a kind of confused look. "Tomato what? Tomato pie? 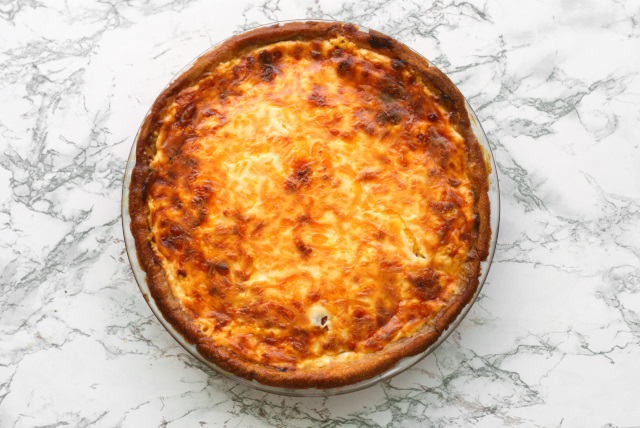 Like quiche? Wait, what's tomato pie?" 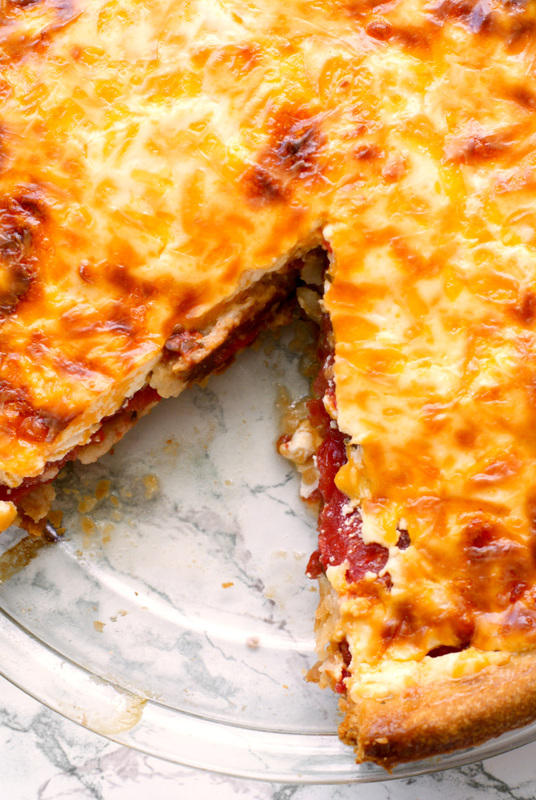 Tomato pie is just that. A pie that is full of tomatoes. If you grew up up north, then you understand the draw of a Jersey tomato. Big, juicy, bright red, full of flavor, delicious Jersey tomatoes. If you haven't had one, you're missing out. You know they're good when people make tomato sandwiches with them. And by tomato sandwiches, I mean a sandwich with just tomatoes and mayo. No need for anything else when you've got your hands on a Jersey tomato. This pie highlights all of the tomato's glory and features just a few co-stars. First, you start with a pie crust. Pre-bake it for just a bit and then you're good to go. Then comes the layers of big, beautiful tomatoes. I got two hearty layers from four tomatoes. Perfect. Each layer is topped with salt, pepper, garlic powder, and fresh basil. Keep it simple. Then comes the cheesy co-star layer. The original recipe calls for mayo instead of greek yogurt. I use greek yogurt because I am obsessed with it. Shamelessly obsessed. Make sure you use full fat yogurt and the sharpest cheddar you can find. That's it! Bake that bad boy up until it's beautifully bubbly and golden. Isn't it pretty? Then, you let the pie sit for a bit, cut yourself a big slice, and dive in. The tomatoes are the star. The sharp cheddar and greek yogurt, the perfect accompaniment. I was afraid that the whole thing would be swimming in tomato juices, but to my surprise, it wasn't. See? So, there you have it. Tomato pie. The next time you find yourself with a gaggle of tomatoes, make this pie. 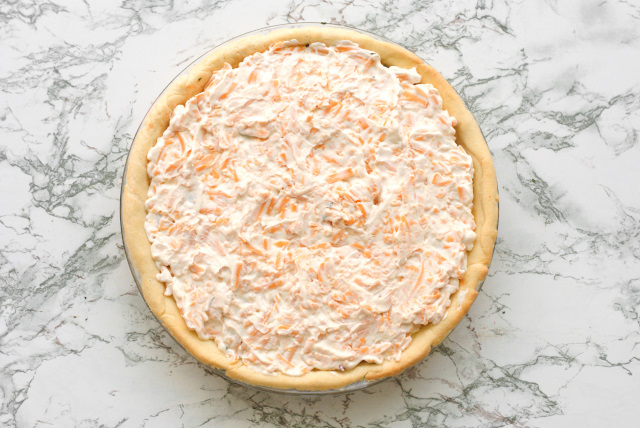 Make this beautiful pie. You'll be glad you did, I promise. Oh, and if you're wondering what occasion this pie would be best suited for, it's all of them. Yes, all of them. Serve it for breakfast, serve it for brunch, serve it for lunch, serve it as a side dish, or serve it as your vegetarian dinner. Heck, I'd even eat it for dessert. 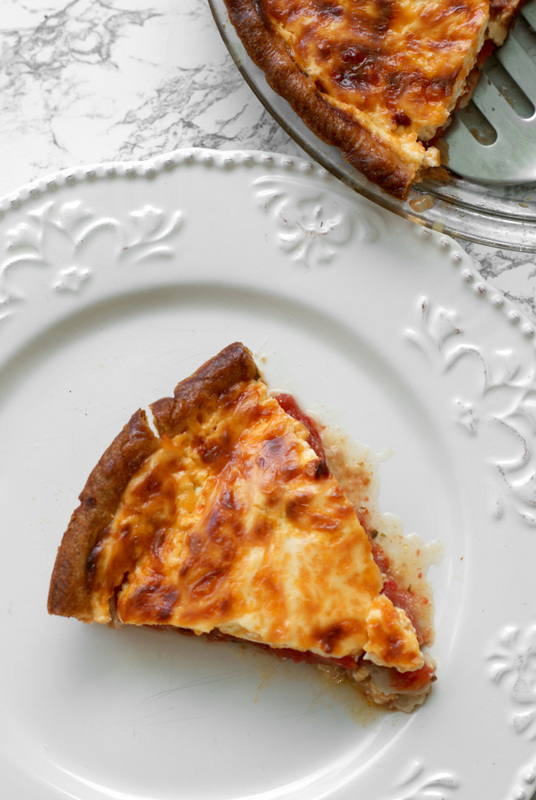 Fresh, flavorful, simple, rustic, cheesy tomato pie will win you over with the first bite. I know you'll want to make it again and again. I know I do! 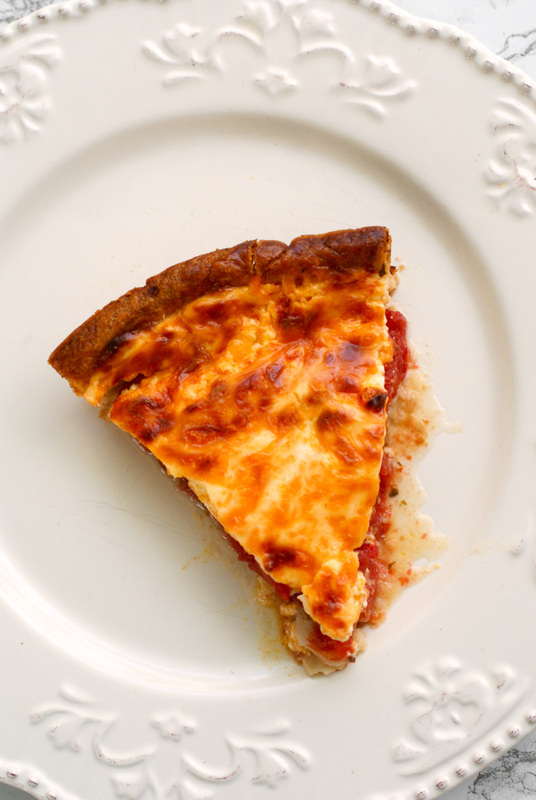 Yay for summer fresh tomatoes and cheesy tomato pie! Lay your peeled tomato slices out on paper towels. Cover with more paper towels and gently press to absorb some of the moisture. Let sit while you prepare the crust. Preheat your oven to 375 degrees. 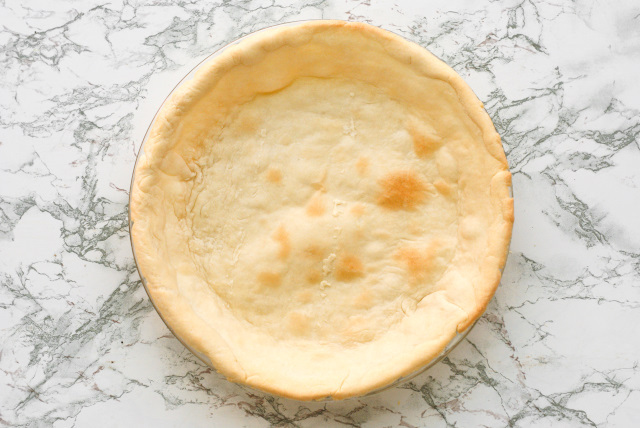 Bake your pie crust for 10 minutes, remove from the oven, and reduce oven temperature to 350 degrees. Layer the tomatoes in the pie crust, sprinkling each layer with salt, pepper, garlic powder, and fresh basil. Combine the greek yogurt and cheddar cheese. Spread the mixture over the top of the tomatoes. Bake at 350 degrees for 35 minutes or until golden and bubbly. Let stand for 5-10 minutes before slicing and serving. *EASILY PEEL TOMATOES: Bring a large pot of water to a boil. Core and then score the tomatoes with an X. Boil the whole tomatoes for 1 minute. Immediately put in an ice bath. The peels will now easily peel off! Source: Adapted from a recipe shared with me by my step-mom, Cindee. 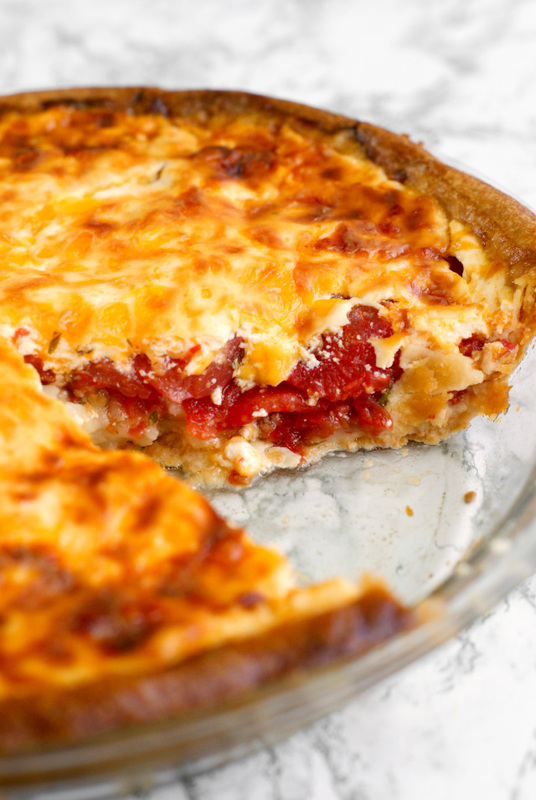 Hi Becky, I found your blog via feastie, and I've gotta say this tomato pie recipe has me drooling. Thanks for sharing such a beautiful recipe - it's going on to the menu for this weekend. Hey, Ann! Thanks for dropping by and for the kind words. I hope you enjoy it! I have made several tomato pies recently, and they are fabulous! The recipe I made last called for mayonnaise instead of the Greek yogurt , but I substituted The yogurt for half the mayo and it is delicious! 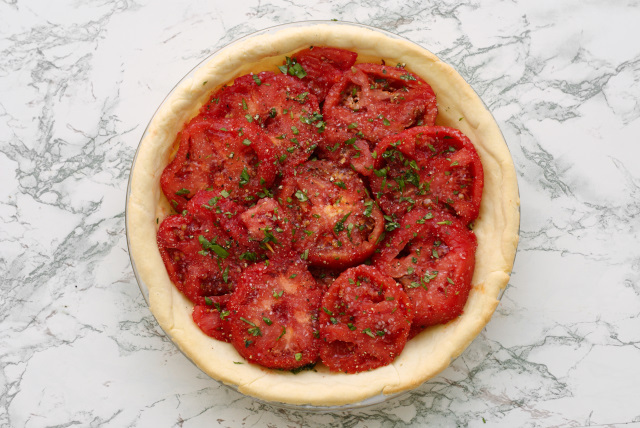 The fresh basil in this pie really completes the flavor and it cannot be stressed enough how important it is to drain the tomatoes as much as possible, to prevent the pie from being soggy! After I read this recipe watering comes in my mouth. I am sure its taste is out of this world. So I am going to try this today. Yes, if using mayo instead of greek yogurt it would be the same amount. I don't see any reason why you couldn't! Sorry, but even after draining the tomatoes this was a soggy, miserable pan of disappointment. Won't be going there a second time.